Last weekend, Steve and I completed our 20-miler in preparation for the Oklahoma City Marathon. That means we are 6 weeks out. We only have one really long run of 22 miles left in this training cycle. It went great. In the past, I’ve felt like the 20-mile run was daunting. Like there was some mystery to it. I may or may not make it. This thought probably originated because of summer fatigue ad training. For a Fall marathon, the 20-miler hits in the peak of the heat. It’s tough running in 80+ degrees, at least for me. Therefore, I have some attempted 20-milers that I chose not to complete. We ran this one in about 25-degree, sunny weather. It was a gorgeous day. It was a really good run. I’ve come to believe that running, like almost everything else, is more mental than physical. Sure, you have to have some distance under your belt before you can go and run 20-miles, and you can’t simply think you can and be successful. However, given that you’ve put some training in, there is no physical reason why you cannot make all 20 miles and still be able to walk at the end. It is very doable. Our minds quickly go to recounting the reasons we cannot, and that is where the real battle is. I’ve become a big proponent of thought work, thanks to my wellness coaches. Consequently, I have a lot of “talks” with myself before and during a run of this length. Positive affirmations are enormously helpful, but only if you believe them. Thought work means creating new thoughts, but for the new thoughts to be effective, they must be believed. And the good news is that we are free to believe. Along with thought work, adequate preparation is very helpful. A strategy for hydration and fuel is very important. Good marathon training will help to set good habits in this area. It is essential. Since we have been training for some time now using Jeff Galloway’s methods, we completed this run with a run/walk strategy that is very similar to the strategy we will use in the race itself. We did this on a 4:1 ratio. We insisted on keeping the first 5-10 miles almost uncomfortably slow. The run went remarkably well. I’m proud of our accomplishment. Each run like this helps to build the confidence necessary to overcome whatever we will face in OKC, including possibly warmer weather. Two more weeks to the 22+-miler, and then it’s taper taper taper! I love the taper. Ordering new shoes today. Excited for that. Looking forward to an amazing day and another finish. Today was one of those very ordinary Tuesday morning runs. Same course we’ve done several times. No big goal in mind other than moving through it successfully with a relaxed and hopefully negative split pace. We change it up if our schedules demand. For instance, I must travel on the weekend fairly regularly. We will move our Sunday run to Saturday, resting on Friday, or even move our Sunday run to Friday, essentially switching Friday and Sunday. Predictable regularity allows for situational flexibility. That’s kind of the point. Without a routine, you don’t have flexibility. You simply have no plan. In my discovery journey of the last 15 months or so, I have found that living without any kind of plan simply does not work for me in attaining any kind of goal. Don’t get me wrong – I love flexibility. But flexibility is meaningless without a plan. I had a conversation with a work associate who looked at my planning journal and became overwhelmed with the thought of “spending so much time” doing all that planning. The fact is, though, that it really isn’t all that much time. It is just consistent daily practice, combined with prioritizing certain things over others. In the pursuit of faith development, or in what we call our spiritual life or devotional life, we embrace “disciplines.” These are practices, or habits. In a way, this becomes ordinary. Regular. Predictable. Over the long haul, these small habits compound in their effectiveness. The trouble is that we often are too impatient to trust this process. Well, this started rambling a bit. But it is where my head is. I’m delighting in the fact that, 14-15 months ago, I recommitted to my maintaining a healthier me – at least in the areas over which I have control. At the time, I thought this meant garnering enough will power to eat better and run multiple times per week. What I began to discover, however, was that my mind was what needed the work. And it still does. I’ve proud of what I have been able to accomplish in a year’s time – all through taking small steps – creating routines, delighting in the ordinary, working on my thoughts, etc. I’ve much more to say on this. But I don’t want to obsess over this blog writing. One step at a time. One movement at a time. I actually know better than to try to answer that question. I was talking to a good friend today about writing, blogging, reading, etc., and it occurred to me that updating this blog has been on my mental to-do list for quite a while. The trouble with a mental to-do list, of course, is that it never really becomes an actual to-do list. Rather than beat myself up about it, I chose today to simply take action and write something here. On April 28, 2019, we will complete the Oklahoma City Marathon. I haven’t run OKC since 2012, and I’m really looking forward to doing it again. We started training formally in February, and we are into the long miles now. This weekend, we have a 20-miler. Steve really nailed his 18-miler a couple of weeks ago, and I’m looking forward to a good day on Sunday. We’re still training the Galloway way, and we’re loving it. I’m trying to help Steve remember to be more conservative starting out in order to finish strong. It goes against his nature, as it does most runners. He’s doing a great job of training. In addition to our runs, we cross train at Camp Gladiator three days per week. Loving that too. Next month, I will have faithfully worked out 3 times per week (with only a couple of exceptions) for a year. Let’s hear it for forming habits! My weight has continued to come off, and I have less that 20 pounds to reach my lifetime maintenance goal. That is an exciting place to be. I have a lot to say about that, and I’ve very thankful for good coaching. So, there you go. Expect to see more posts more regularly. Remember to breathe. And move. And eat sensibly. And all that stuff. Chicago Marathon 2018, my 6th Chicago Marathon and 12th marathon overall is done! I feel great about this race. I don’t think any of my other marathons compare to the high and the sense of accomplishment that I felt yesterday. This was an average Chicago time for me – some have been slower, some have been faster. I was 1:09 slower than my PR. None of that mattered, though. I started wanting simply to finish feeling good. And I did that. I did have a rough time goal of 5:45. I ran close to the 5:45 pace group for the first seven miles, but I was feeling like that pace was just slightly slow, so I went ahead. Learning how to legitimize walk breaks for more consistent performance has been a fun journey. My results this year prove that for me this method beats “banking time” or hammering a faster first half. It feels so good to finish still feeling good with fairly consistent pacing throughout the day. I imagine that as I continue to train, some form of structured walk breaks will be a part of my training. 2. Nutrition, Hydration and MORE BANANAS! I worked on reasonable carb loading throughout the weekend, and I hydrated effectively for several days leading up to Sunday. I carried my water bottle and refilled it at aid stations as needed. I took more GU on the course than had in other races, and I consumed 4 bananas – 2 pre-race, one at mile 8.5, and one more in pieces as they were offered. I tried hard to stay ahead of nutritional need. I think it helped the energy stay even. I was in the last corral of the last wave. I declined the opportunity to run in the second wave with the charity runners. I don’t love the feeling of people needing to pass me. So, I was truthful when I registered about my predicted finish time. I also found a 5:45 pace group that was committed to structured walk breaks. I recommend running with a pace group. It is the best way to relax and trust the process. As it turned out, I stayed a few minutes ahead of my group. I was thrilled to learn that my friend Cynthia Sandusky was running in the same corral with me. We found each other and planned to kind of stick together. We ran side by side for the first 18.5 miles, taking our walk breaks together – except for my potty breaks. I took one around mile 3, and spent the next 3 miles catching up. Running with someone makes the time go by faster, and it allows for encouragement. We committed to each other that if one of us slowed, the other would go on. She pulled back a little before 19, and I knew it was OK to go ahead and finish at my pace. My charity, Team World Vision practically insists on this. I’ve always felt a little awkward about it. However, I submit because I’m a rule follower. Here’s the thing, though. Even though it is a little cheesy, there is nothing like the crowd support that results from it. People were calling me out all day, by name, encouraging me. I could see the adrenaline result in my pace from time to time. Over a dozen times, groups of people would chant, “Greg! Greg! Greg! Greg…” These were funny moments. At one point, a couple of people behind me asked me if I was some kind of celebrity. I turned to show them my shirt, and we all had a good laugh. At one point, a guy behind me said his name was Greg so he wanted to stick close to me for the crowd support. Chicago rivals New York in crowd support, and it makes a huge difference. It feels good to be constantly encouraged and cheered on. I’m really glad that the trend has swung back so hard to cushy shoes. My friend Jarod Root introduced me to these shoes when I was dealing with Plantar. I think they got me back to running. No disrespect to all the minimalists out there – it’s all good – but I love my HOKAs. I’m open to something better coming along, but I sure do love these shoes. I tried really hard to only think positive thoughts, like, “You’re doing great. You can trust your training. You are strong,” etc. When I got to the last 10K, I counted down first the miles, “Only 6 more miles, Less than 6 miles,” etc. When I got to the last 30 minutes, I counted segments down. Since I was running/walking in 5-minute chunks, at 30 minutes, I had only six segments left. Then 5. Eventually, “C’mon, Greg, you’re on your last segment.” I said out loud, “You’ve got this” probably 100 times throughout the race, mostly in the last half. I followed my tapering instructions as per my plan. On the day before the race, I stayed off my feet as much as possible. We ate lunch out, a few blocks away from the hotel. Then, we returned, rested, ordered Uber Eats (spaghetti), watched a movie, and went to bed. In past years, we’ve spent much of Saturday walking around the city. I think it is better to be as fresh as possible on race morning. I was fortunate to know the course since this was my 6th time to run it. There were minor changes this year. I think the changes were good. Mostly, the West side of the course was shorter or broken up more. Fortunately, I had no digestive issues during the race. That was good. However, I had consumed quite a bit of water that morning. As it turned out, there was a little confusion about the amount of time it would take to get into the start corral. For instance, it looked like we were merely lining up at a security gate, In fact, I was actually in a bag check line that was moving slowly. I didn’t have a bag, as our TWV tent offered private gear check. Consequently, I wasted 15 minutes that I would need later. By the time I got through security, it was already time to enter my corral. I had to urinate, so I got into one of the long port-a-potty lines. I waited and waited, really needing to go until they announced that the start corrals were about to close. There was no way I was going to get to use the bathroom before the start corral closed. So, I entered the start corral and got lined up. I decided that I would simply have to find the first available toilets on the course or wait to find a tree in Lincoln Park, about 4.5 miles in. Normally, hundreds of male runners find trees in that area. I really needed to go, so running and walking were both pretty uncomfortable. By mile three, it was nearly excruciating. My back was hurting. I told Cynthia that I was going to have to peel off at the next toilet and then catch up to her later. When I exited to the toilet, there were only four people in line ahead of me. I was initially encouraged by this. But then, when my body realized I was close to relief, the need to go became more than urgent. I danced, contorted, and tried my best to hold it for another minute. Unfortunately, I had passed the point of no return. I realized my effort would not be enough. I apologized to everyone around me just as the fountain erupted. So I watered that street right out in front of everyone. People politely looked away. Just then, a toilet became available, and I went in to finish. Gross. I managed to catch up to Cynthia and my pace group just about the time I needed to go again. I made four potty stops in the first half of the race. I obviously stopped taking in liquid for a bit to try to adjust. My body was clearly plenty hydrated. Those are really the only things that did not go well. I ran consistently. I am proudest of that. There was only a 36-second variance in my slowest and fastest splits. I usually feel good with anything under a minute. My halves were within one minute of each other. That is very consistent. I feel great about this. I finished feeling good. Ready to stop, of course, but I never hit the wall. In all but one of my other 5-hour-plus races, My first half has been quite a bit faster than my second half. This race proved that a slower start really does make a difference. I proved it to myself. No finish has ever felt better to me. I was very emotional from about mile 20 to the end. When I saw the turn onto Roosevelt ahead of me, I knew I had it. And when I saw my beautiful wife Marla and best friends Mike and Lisa standing there waiting for me to make that turn, I felt better than ever. For a moment, I felt like there is nothing I cannot do. Chicago is my favorite for many reasons. That corner. That hill, that final downhill to the finish line is worth every mile of training and every bit of pain. 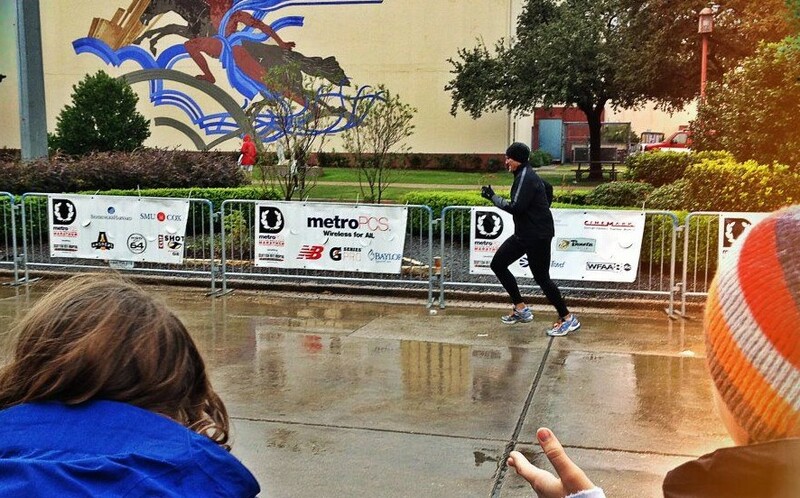 Crossing a marathon finish line is one of the best feelings there is. I am so thankful for my family and friends who constantly encourage me and cheer me on in my marathon endeavors. They are the best. I don’t know how people do it without a lot of support. My first call as soon as I get my medal is always to my daughter Clayre, who got me into this mess in the first place by talking me into running this race in 2010. I usually can’t say much when she answers the phone. I mostly cry, and try to say, “I did it!” And she says she is proud of me. Thanks for reading. I will try to keep you updated on more adventures in running. Week 17 of training called for a long slow distance run of at least 20 miles. I was pretty anxious about this one since it has been nearly 4 years since I have run at least that distance (and that was during a marathon). The last successful 20-mile training run for me was on September 14, 2013. In addition to that, I have had to cut my last two long runs a little short for various reasons. Because of a family birthday celebration, I didn’t get to bed early enough. Consequently, I only got about 3.5 hours of sleep before needing to get up and get ready to run. My original plan was to run three loops, all beginning and ending at my house. The first two loops were to be about 8 miles each, leaving a final loop of 4 miles. My intent was to have a smaller amount of miles to run on the third loop when I knew I would be getting more tired. The reason I like to begin and end at my house is to trade out water bottles, use the restroom if necessary, and change wet shorts for dry shorts on the really hot mornings. I also take only enough GUs for the loop I have to run. During the first loop, I began to think this was going to be a really tough day. As I passed the 6-mile mark, however, I began to feel more alert and alive. I was comfortable with where I was. I stopped at the house at 8 miles, used the restroom, changed my shirt, and traded out for my next water bottle. About 3 miles into the second loop, I began to feel pretty solid. I had the idea that if I extended this loop by a mile or two, my third loop could end up begin really short. That was an attractive idea. My only issue was that I would need to refill my water bottle. I decided to go ahead and extend my outbound by a couple of miles, thinking that I could refill my bottle at the Whataburger at Main and I-35. This idea seemed pretty good to me. So, I went for it. Using positive affirmations to keep my mind right. I think this made a tremendous difference in transferring the anxiety I had about this run into something positive. I’m going to seriously utilize this technique from now on. I was very thankful that my running buddy Steve, who is recovering from an ankle injury, decided to find me at around mile 16 to simply encourage me and see if I needed anything. He ended up bringing me an extra GU and some more hydration. I appreciated this very much. He is a true friend. I’m looking forward to running together again soon. I felt very accomplished at the end of this one. I am close enough to marathon distance now to see it again. I have two more long slow distance runs before the big day, along with some track workouts in between. Please visit my fundraising page and either donate to my race or sponsor a child through World Vision. I am nearly halfway to my goal of $3,000 raised. Please note, if you sponsor a child, you will need to also complete this very short form so that my fundraising is credited properly. If you have any questions, please let me know! Marathon Training 2018 – Catch Up! A month went by without my posting updates. That went by fast. I’m going to try to catch this think up, bit by bit with a little additional information thrown in as I think of it. Where am I in the training plan? I just completed Week 16. That means the marathon is 10 weeks away from the Sunday I just passed. What’s left on the training plan? Three more long runs 20+ miles each, depending on how far I can take it), five more tempo-type runs (mile repeats or “magic mile” repeats, and one plain 7-mile jog. Those are the weekend runs, of course. The weeks don’t change that much except for the last couple of weeks leading up to the marathon. That is a “taper” time, where I will run less weekly than I have been running. The idea is to come down off of the aggressive plan to allow the body to get ready for the big day. Mostly confident. The majority of my runs go well. Each really long run has really felt long…my biggest fear right now is hitting the wall, of course. And since I’m training differently than I ever have, I don’t have a baseline comparison. I am feeling stronger, and I know that my endurance is building. My weight has been coming off according to plan, losing 8-10 pounds monthly. Each loss makes running a little easier. I still have a ways to go, but I’m feeling great about my progress this year. I’m feeling even better than I think I have resolved to work on the issues behind the weight gain…which is harder in some ways than just doing some kind of diet plan. I will post some observations soon. Right now, weekly, I experience a pleasant weigh-in with lots of non-scale victories. Steve may be out for four more weeks. He’s hating that. His ankle is improving. He’s more mobile now. Not ready to run yet, but he is making progress daily. I’m looking forward to running some with him soon and continuing the training cycle with him after Chicago. This weekend will bring a 20+-mile run. I’ve been mapping it out into three segments that begin and end at my house so that I can refresh water, potty if necessary, and change shorts if it is a very hot morning. More later, but there is the update for right now. A Week with Ups and Downs! Look at that – I made that blue. Bad news first. Steve suffered an injury on Tuesday morning. We were nearly done with a very routine run, and in the last few steps, an old injury tried to happen again. He had a tear in his right calf years ago, and he now felt it pulling as if it was going to maybe tear again. I could tell it was painful…and frustrating. He hobbled home, went to the doctor, and determined it needed rest, ice, medication, etc. But mostly rest. He could barely walk on it. So, that was a pretty big “down.” I did the Wednesday, Thursday, and Friday workouts alone. This was interesting. I’m really used to running with my buddy, so it felt pretty strange. On Sunday, the task was 5 miles with the “magic mile,” which in Galloway talk is basically a timed mile at a faster-than-usual pace. This is easily done on a track, so we met at Briarhill for this one. Steve walked the whole time I was doing the running workout. My plan was to do 2 easy miles, a third “magic mile,” and two finishing miles. I posted the picture because I thought it was funny. Track workouts look funny to me. You can see when I decided that a bathroom stop was no longer optional! I decided during the pace mile not to look at my watch at all. Just did not want to deal with whether I was doing well or not, etc. I just ran a little faster without sprinting. My magic mile came in at 9:47. I was encouraged by this. My last two miles got a little boring, but that’s what it’s like to run around a track for nearly an hour. I do another magic mile in a few weeks. I’m anticipating that I’ll be a little faster. Within about 6 weeks, I should be able to predict a reasonable estimation of what my marathon time should look like. I keep saying that I will write on pace and time. It’s been a journey this time. I’ve had to do some work inside with what I’m thinking and feeling. I don’t feel like getting into it today. Overall this week, I felt good and strong, but I missed my running buddy. He’s going to take most if not all of this week off as well. This Saturday, 17 miles. At White Rock. Should be fun.